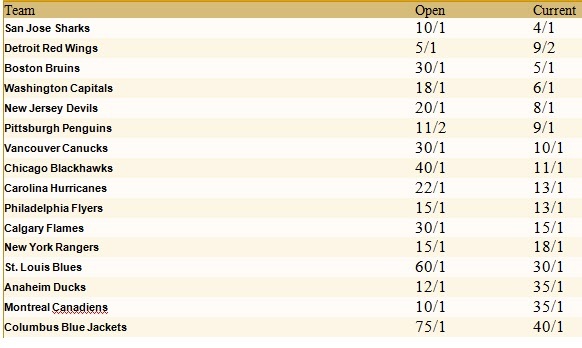 Online oddsmakers/betting house Bodog has listed its Las Vegas betting odds for the Stanley Cup. Here are the rankings as of today, with the list of the teams and their chances of winning the Stanley Cup according to the Vegas analysts. The odds in brackets are the betting lines as they were when the oddsmakers set the lines back in August 2008, before the start of the current season. Interesting to see how some teams' chances have increased, while others have gone in the opposite direction. wow how the might have fallen, referring to montreal now at 45 to 1 odds as opposed to 10 to 1 as they were before, would get more assurances with betting on St. Louis rather than Montreal. I'll put a 20 on Columbus at that rate. The Guy With The Mustache wrote: I'll put a 20 on Columbus at that rate. Hmmm. You want to do that, do you? Maybe the 504Heater Betting Shop will open. Count me in on the Columbus sweepstakes! Just a hunch, but SO much rides on the goaltending.